Following an unusual path through healthcare has given Senior Theatre Practitioner Kerry Scott a wonderful tale to tell about her journey into the NHS. 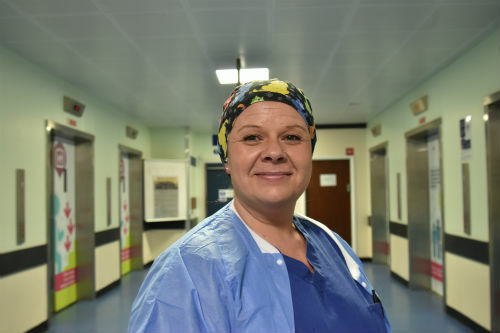 Understanding how important cleanliness is to the welfare of patients is a great discipline for anyone working within the operating theatre environment, so Kerry had a good head start on moving into her role in theatres. Working within theatres is not for the faint-hearted, but for the mum-of-two Kerry, it’s where she feels most comfortable and loves every moment. She smiled: “It gives me a great sense of satisfaction. We save lives and make a difference to our patients on a daily basis. As a senior theatre practitioner, Kerry’s main responsibility is to ensure all the equipment is clean and ready for operations. She also works with anaesthetists and supports surgeons during operations. Kerry, 45, credits her team for her success. She said: “We are a close-knit team and we support each other in many ways. If a new person joins, no matter what their rank is, they will always have a buddy to support them in the first three months, so they can learn quickly and adapt to the new environment. “We often go out with each other after work and if a member of the team is having a challenging time at home or at work, we always support them. For her next challenge, Kerry and one of her colleagues will be looking at equipping the Midland Metropolitan Hospital with cutting edge technology for the department.